Fill in your details below and we will let you know within 24 hours if we can get Star Realms: The Alignment Command Deck to you with haste! 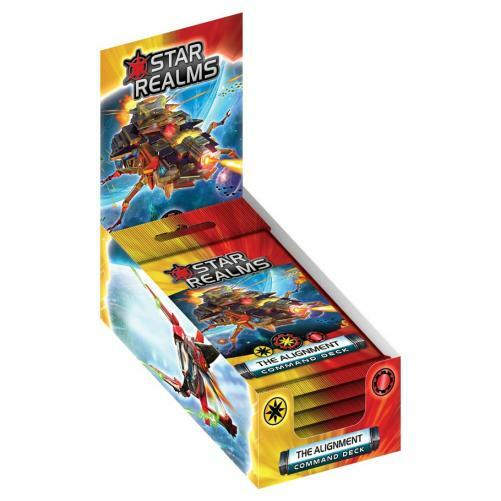 • Use with any Star Realms set. • A Legendary Commander card which shows your Commander’s hand size and starting Authority! • Your Commander’s custom 12-card starting deck which includes new cards from your Commander’s two favored factions! • 2 Gambit cards, unique to your Commander! • 2 new, easy to use score cards. • A Mega-Ship for your trade deck. • Battle against other commanders, or play as a raid boss taking on multiple opponents who play standard decks! Play as Divine Admiral Le. Hone your fleet to deadly perfection with the Star Empire’s martial prowess and the Machine Cult’s ruthless efficiency! Battle against another Command Deck, or play as a raid boss!